While Kataoka Tomo (片岡とも) is a fairly prolific writer in the visual novel scene, I don’t think I ever seen him work alone; and most of his collaboratives in NekoNeko Soft, while not afraid to tackle something new (Scarlett) are mostly underwhelming and forgettable. 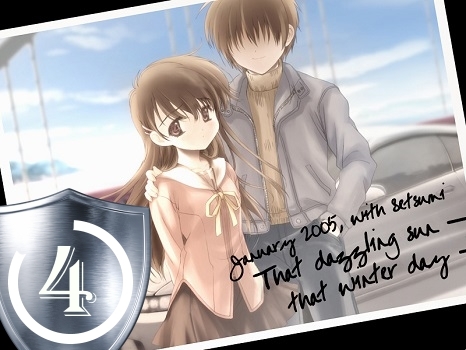 Yet his only solo (as far as I know) work, Narcissu, a thought-provoking drama about the frailty of human lives, is among my very favorite visual novels. Being a doujin work, this work is already amongst the type I most respect – a canvas to express ideas and feelings rather than trying to make money from them. As you take the short aimless journey through Japan together with the two mortally ill characters, you are both emotionally engrossed in their sad fate and reminded of your own frail mortality. Its short length (only two hours) eliminates all pacing issues with every word actually counting for something, and being just enough to flesh out the characters and convey its simple yet heartfelt message. If that’s not enough to get you interested, let it be known to you that Narcissu also has one of the most amazing soundtracks in the medium, full of melancholic pieces that make it pretty much impossible to resist losing yourself in this gloomy tale. It might not be an epic story, it might not exactly blow your mind as the narrative is inherently predictable, but it can sure break your heart and make you take a second look at the privilege that is your life.